Japanese brand Nendo has designed three unusual variations of the traditional cuckoo clock, including one that doubles up as a bookend, and one that naturally rests on its roof. 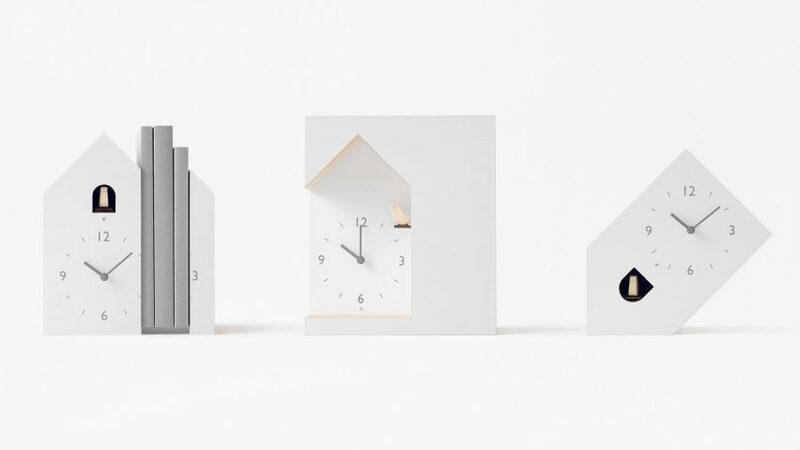 Each of the three models are modern adaptations of the traditional, steeple-topped cuckoo clock, which has its origins rooted in Germany's Black Forest. 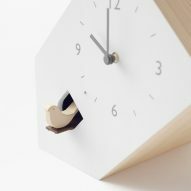 Ornate wooden carvings and hanging pendulums are replaced with clean-cut lines and simple white faces, as Nendo uses its characteristic minimalism to reinterpret the 17th century design. 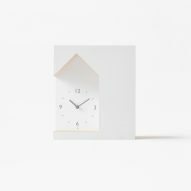 The three models were created for Lemnos, a Japanese brand that specialises in contemporary and modern clocks with minimal designs. A cuckoo clock that doubles up as a pair of bookends is featured in the collection. By splitting the dial's face into two parts, the user can prop-up a stack of books within the clock. 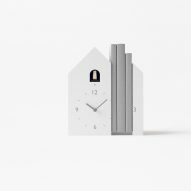 According to Nendo, "this merge comes naturally as the clock and books co-exist on the shelf harmoniously together." 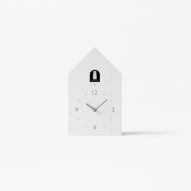 The second take on the Bavarian design sees Nendo challenge the cuckoo clock's normal orientation. 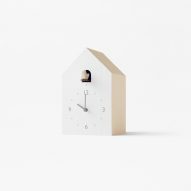 By setting the cuckoo bird and the dial design at unusual angles, the user is invited to ignore convention and place the clock upside-down, tilting it so that it rests on one side of its steeple-top. The topsy-turvy clock is able to naturally maintain its balance as the heavier internal components have been placed asymmetrically on one side. 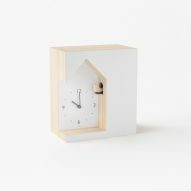 The third model features a large dent in its side, which is designed to look as if the traditional clock has been carved out of the square block. 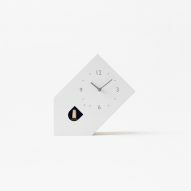 The cuckoo bird then peeks out sideways from a small hole on the side of the clock. Nendo previously created a series of four unconventionally shaped hourglasses, carved from blocks of transparent acrylic, designed to "change the perception of the flow of time."